This was the most venerated icon in Constantinople, called the Hodegetria (meaning showing the way in Greek) after the Hodegon where it was kept. This icon was the symbol of the city, carried in processions and in battle. According to tradition, it was painted by St. Luke himself and sent from Jerusalem to Constantinople by the Empress Eudocia. 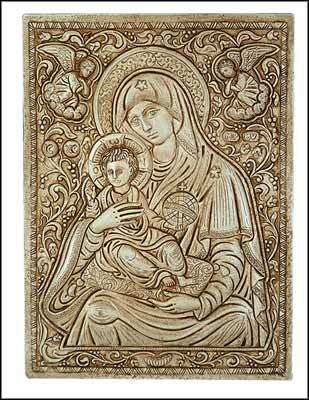 The original icon was lost in the sack of Constantinople in 1453. Mary was probably born in Nazareth. When Mary reached marriage age she was engaged to Joseph, the marriage ceremony schedule for a year later. Six months later Archangel Gabriel appeared to her and announced that the Holy Spirit will come upon her and conceived a holy offspring to be called Son of God and to be named Jesus. Mary responded: �I�m the servant of the Lord. Let it be done to me as you say�. Thus, Mary became the Mother of the Christ and is regarded as the mother of the church and �Queen of Heaven and Earth�. Mary died several years after Jesus own death and according to tradition, when the apostles opened the coffin, only lilies were found.